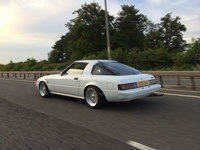 Johnnyboy wrote: Just paid £750 for 3no 255x40 zr18 P-Zero Assimetricos for the XJR..... that's £1000 a set and I'm told that's the last I'll get at that price, they're going up again next year..... rip off! I should park up until summer comes if I were you. Digging up an old thread as it tyre time. Stock S3 rim. The selection of 205/60r14 is still small. Current picks seem to be Khumo Escta and Nankang NS2. I read somewhere that the car actually handles better on 195/60r14 with better steering feel? There is a wider selection including some Continentials premium contacts. Any thoughts? Can you get Proxies and Bridgestone in 205/60r14 in Germany? They only come in 195/60r14 here. 205 60 14 aren't on the list of tyres becoming available.